At Aucapan (39°38’ S, 71°17’ W) just 32 km (20 mi.) northwest of the Argentine town of Junín de los Andes, a strange creature is said to live in a tiny lake, the “Huaca Mamül”. This is a cow-like creature, whose name (“Huaca Mamül”)in Mapudungun (the language of the Mapuche natives) means “cow stick” (“huaca” = cow and “mamül” = stick). In this map, Aucapan is located above the Malleo River, which is the outlet of Lake Tromen. It is roughly where the "M" of Malleo appears on the map. Notice that the range of hills south of Malleo, between Aucapan and Lake Huechulafquen (home to the lake monster "Huechulito"), are named Mamuil Malal or "hills of sticks" perhaps alluding to them as home to the "living stick". The beast is said to bellow like a cow with a sharp and explosive “Aaaa…”; it is described as a “live stick” (palo vivo in Spanish) which is found “in the middle of the forests between Aucapan and Chile, in a tiny hidden lake”. 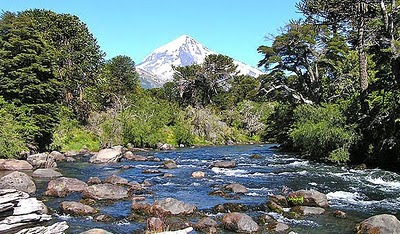 Aucapan Creek is a stream which flows into the Aluminé River (see the map) between the Malleo and Quillén rivers (Quillén is home to a "Cuero uñudo").